Getting up on dark, winter mornings can be a challenge. Luckily, this warm bowl of morning goodness is reason enough to get out of bed. Some people like traditional porridge or oats, but quinoa is a great alternative. It’s a source of protein, essential amino acids, fibre, B vitamins, minerals, and antioxidants. No wonder so many people consider it a superfood. Plus, quinoa contains gluten-free carbohydrates to give you the energy you need to tackle the day ahead. We’re sharing our favourite way to prepare it – Ambrosia apple infused quinoa with raw Ambrosias on top. Add cinnamon and it’s almost like you’re having apple pie for breakfast! We also top it with a healthy selection of nuts, seeds, dried fruit, and yogurt. 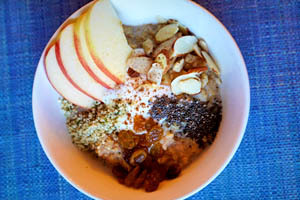 The best part about this Ambrosia apple and quinoa breakfast bowl is that you can tailor it to your taste. You can make it different every day just by changing the toppings. There are so many topping choices. You could try coconut flakes, pumpkin seeds, dried tart cherries, cacao nibs – the options are almost endless. If you’re a fan of peanut butter, you might want to try stirring it into the yogurt – it goes very well with Ambrosia apples. No matter how you top it, the combination of quinoa, milk (or milk alternative), and Ambrosia apples makes this a balanced and healthy way to start your day. Plus, each bowl is like a work of art that is sure to put a smile on your face and brighten up your winter morning. Core the Ambrosia apple. Dice half of the apple into small cubes. Set the other half aside as a topping. On medium heat carefully bring milk to a simmer. Stir regularly to ensure you don’t burn the milk. Once the milk is simmering, add the apples, quinoa, and cinnamon. Reduce heat to low and simmer for 15 minutes. It will still be a little runny but the quinoa should be soft. Remove from heat and stir in maple syrup. Top each bowl with sliced Ambrosia apples, hemp hearts, almonds, raisins, chia seeds, and yogurt. Sprinkle with cinnamon to taste. Now you’re ready to tackle the day!